Salted Caramel Fudge. OMG you guys! I was excited after I made the 3 ingredient peanut butter fudge, but I am even more excited about this Salted Caramel Vegan Fudge! It’s seriously delicious and also dangerous! This Salted Caramel fudge has a few more ingredients, but it’s a must make! If you like recipes with small ingredient lists, check out this post. 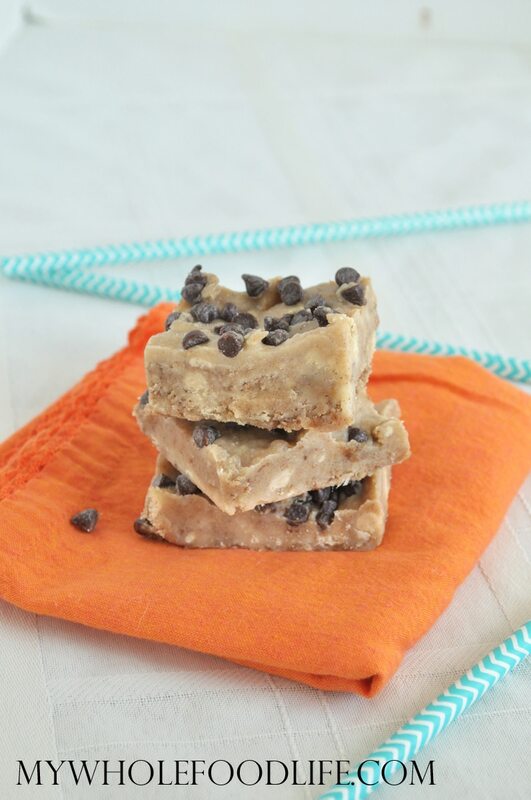 This healthy fudge recipe is vegan, gluten free and paleo approved! You can make it in just a few minutes. I hope you enjoy it as much as I did. If you love all things salted caramel, you will love these cookies. If you want to make your own cashew butter for this recipe, follow the steps in this short video. For more videos, you can subscribe to my You Tube Channel. Looking for more salted caramel recipes? Soak the dates in water for 30 minutes. Then drain and add them to a blender or food processor with the sea salt and vanilla beans. Blend into a caramel. In a small saucepan , on medium low heat, add the cashew butter, coconut oil and maple syrup. Stir until everything is combined. Fold in the caramel mixture. Line an 8x8 baking dish with parchment paper. Spoon the batter into the baking dish . If you want, sprinkle with chocolate chips. Place the baking sheet in the freezer to set. Once it's set, use a pizza cutter to cut into squares. Store in the fridge or freezer. should the saucepan be over low heat when combining the coconut oil, maple syrup and cashew butter? Just asking because it doesn't specify! This recipe looks delicious. OMG These look amazing! Thank you for sharing this! I love salted caramel but it's not usually vegan friendly. I can't wait to try this out! I am not sure that will work in this. Butter may work though. what can I use instead of cashew butter....nut allergies? This one looks absolutely amazing. Thanks! Hi Melissa! I made these tonight (just stuck them in the freezer) and for some reason I could not get the cashew butter to blend well with the coconut oil and syrup. It just seemed so "oily" no matter how long I stirred. Just wondering if I didn't do something right, but anxious to taste them! I made these and they are amazing! Seriously dangerously good! How do you come up with such great things. I would never have thought to put these things together. Yay! Glad you like them! :) I have these kinds of things in my head all the time haha. I love to bake. If I use One and a half cups cashews for the cashew butter as you did in the video, will that be enough cashew butter (1 1/4 cup) for this recipe? Thanks! I love your recipes.